Is shampoo available in the Philippines? What about cheese, peanut butter, etc.? I remember these were things I wish I’d known before I went. Here’s a list of things that you might be wondering about. Whether you’re headed to the Philippines, or trying to figure out what to send your loved one in a care package, it’s good to know what you can and can’t get there. *This is coming from my experience living in the Northern Philippines for 18 months. Things may be slightly different in other areas in the Philippines. Anyone with expertise on other areas of the Philippines, feel free to let me know so we can add more helpful info for readers! Yes, there is soap in the Philippines. Just be aware that a lot of the soap has “whitening” agents to lighten up the skin, so be careful not get that kind if that’s not what you want. Yes, these are also available. They are sold in bottles as well as individual packets. They’ve got a pretty good selection of brands but not every single brand. Most over-the-counter drugs are available in the Philippines, but they may be under a different name, so you need to make sure you know what you’re getting. Drug stores are everywhere there, and you often can get a lot of things over-the-counter that are sold prescription-only in the U.S. They don’t have ranch dressing mix, so you might want to bring some if you like to eat it a lot. Yes, you can usually find brown gravy or something similar there. Laundry soap and dish soap is very readily available, usually sold in individual packets (because most people do their own laundry by hand there). They’ve got Tide and some different brands as well. Yes you’ll probably be able to find most cosmetics you’re looking for there. I’m not sure if they are all the same brands as in the U.S. though. Yes, Hall’s cough drops are available. But make sure to look in the candy section to find them. They have lots of crackers, cookies, and snacks! They have Ritz and Saltine-like crackers, but they’re different brands: Fita and Skyflakes, or Rebisco. They often sell them in packages with a bunch of individual packets. They have lots of creative snacks, like crackers covered with different flavors of frosting, or oreo-like cookies with different flavored fillings. Chips Ahoy and Oreos are available in the malls, but at a higher price than the Filipino brands. Yes, noodles are available. Aside from Asian rice noodles, there’s lots of spaghetti noodles, macaroni, as well as Raman and Cup-a-Noodles. Yes, peanut butter is easy to find. The imported brands like Jiffy are more expensive but they also sell peanut butter made in the Philippines. Peanuts are also sold. Jam is also sold. Look for mango jelly – it’s the best! Oatmeal is available in large packages as well as individual packets. There’s chocolate, banana, vanilla, & sweet corn flavored oatmeal, as well as oatmeal drink packets. Pancake mix is also available. Not available in most places. But many stores do sell popcorn kernels that come with cheese packets that can be used to make it if you want. Not available in most places. I did find it once in the Baguio SM mall. Available in most places. But they are a little different, so bring some with you if you prefer certain brands. Tampons are harder to find. This was probably one of the biggest rumors I heard before going to the Philippines (that they don’t have it). Yes, they have toilet paper. Not everyone may use it, but you can get it just fine. Yes, you can find juice anywhere you go. Dole fruit juice in cans and Tang are quite popular. What would I do without chocolate? There’s plenty of this in the Philippines! In the malls, you can find well-known candy bars (such as Snickers, Kit kats, and Toblerone), but they are quite pricey. Goya is a popular brand of chocolate there. They also sell Nutella, and sometimes even brownie mix. The country also has their own candybar brands, such as Cloud 9 and Choco Mucho. They are pretty good and way more affordable than the imported ones. You can’t really find chewy granola bars. Sometimes you can find the hard ones at malls. But try out the Cloud 9 “cereal” bar – it’s about the closest you can get. I used to get a whole package of these every week. Yum! You can find cold cereal here, like corn flakes, but it is imported (& hence, expensive). This was another rumor I heard – that there was no ice cream in the Philippines. I guess people assumed because they didn’t drink milk they didn’t have ice cream. Not true. Filipinos love ice cream! They don’t sell a ton of flavors, but they do offer some really good chocolate-based flavors, like rocky road, and other kinds. They also sell Filipino flavors like melon, cheese, mango, ube, macapuno, etc. Often malls carry individual things of yogurt. Sometimes they don’t. But they’re a little more expensive. They also sell individual yogurt drinks. If I recall correctly, I don’t think they have this. Maybe at some big city malls. Hard to find. Might be available in larger malls. If you’re looking for cream of chicken soup, there are substitutable chicken soup mixes sold in most grocery stores. I don’t recall ever seeing this. They sell lots of different kinds of candy. You can also find Skittles, Mentos, Gum, etc. They carry lots of hot dogs. Sometimes you can find chicken nuggets in the malls, or mixed veggies. They carry lots of Asian frozen stuff, such as siopao, lumpia, bangus, fish balls, etc. The regular cheese used in the Philippines is shelf-stable. It’s different than normal cheddar cheese (softer maybe?) but not quite like velveeta. Occasionally you can find regular cheese in the refrigerated section, but it’s very expensive. They sell lots of seafood (usually whole) as well as chicken, pork, and beef. Ground pork/beef is usually available in the malls. Most Filipinos don’t really drink milk. The milk that is sold in malls comes in a carton and is shelf-stable. It tastes a bit different than normal milk but not much. Individual cartons of chocolate milk are often sold (refrigerated). Tuna, corned beef, and spam are the majority of canned meats. And they come in all sorts of varieties and flavors! You probably won’t find chili, beans, ravioli, or other ready made stuff in a can. Sweetened condensed milk is sold. Canned fruit cocktail is better in the Philippines because it includes coconut gel cubes. Yum! 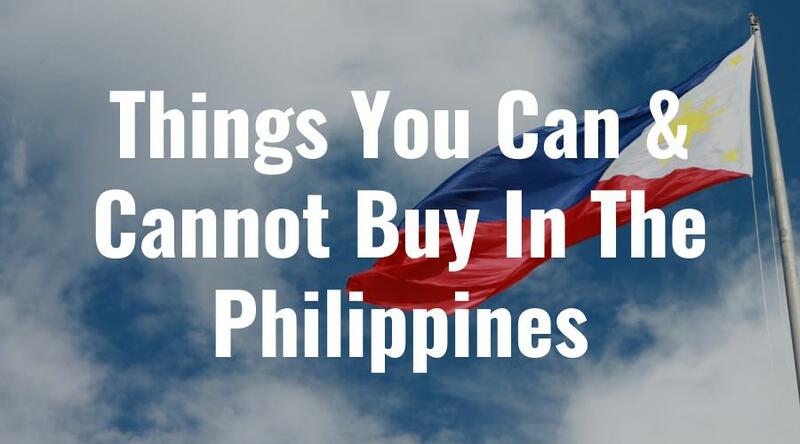 They have lots of chips – mostly Filipino brands. You can also often find tortilla chips, Doritos, Cheetos, and Lay’s, but they are imported. Yes, you can get batteries, usually at the mall. They are also often available at photo printing centers. This is easy to find anywhere. Italian-style is the regular stuff we use in the states. Pinoy-style is the sweeter stuff used in Filipino-style spaghetti (more common and sometimes easier to find). Yes, oil is easy to get anywhere. Lots of Filipino food is fried. Coconut oil is the most common. You probably won’t find microwaveable popcorn at the store. That’s because people don’t have microwaves in the Philippines. But they do sell popcorn kernels that you can pop over the stove. If I remember correctly, I think most baking supplies were available. Flour, sugar, and salt I know for sure were. Baking soda and baking powder – I think so but I honestly can’t remember for sure. (Someone correct me if I’m wrong). One thing to keep in mind is that there’s no ovens (unless you want to pay a high price or have one imported), so you’ll have to do any baking you do with a toaster oven. It’s rare to find these. I found them a couple times in big city malls, but it’s not common to see. Oh yes, you can get bread there. There’s even little bakeries along the side of the road that sell yummy sweet rolls and stuff. They’re quite heavy and rich. My favorite thing was going to get Pandasal (rolls sold by the dozen at little pandasal shops along the road). They are delicious! It’s hard to find wheat bread but some stores carry it. These are very easy to find. Everyone wears them and they are sold everywhere. These are also readily available. Filipinos use them to keep the sun off as well as the rain. You can get this anywhere. This one’s a bit of a hit and miss. You may find some at the mall occasionally, but they don’t always carry it. You can get all these things in department stores (in the mall). Toothpaste is sold everywhere. Floss is harder to find. You can get these there. There are thrift stores called ukay-ukay stores where you can find pretty cheap clothes. You can also a seamstress – they are very talented and skilled. *Some more rural towns don’t have malls, just outdoor markets and sari-sari type shops that carry the basic necessities. *Grocery stores vary in what they carry. It’s a surprise whenever you go shopping. One week you you’ll see something but the week it won’t be there. But this mostly applies to imported stuff, like cheese, and certain types of snacks, etc. The basic Filipino staple foods are always available. *My experience has been that when you first get there, you might crave certain foods back home for the first little bit. But after being out their for a while, it’s not a big deal – You start to crave American food a lot less and enjoy the Filipino lifestyle much more. Want to add something to this list? Feel free to contact us here or comment below. I’m sure she meant not all Filipinos have microwave ~ like me. Why have a microwave when you already have an oven? The only redeeming quality of a microwave is to heat stuff faster. For many Filipinos, this is in the least of their needs. Yeah, carabao milk. Joke. Yeah we do drink milk but not many adults drink it regularly because they are expensive. We do have a problem with Cows and Cow products because our climate and grass isn’t the best for raising cows. So don’t expect quality cheese, milk, beef etc unless they are imported and expensive. I think the best cows you can find here are in batanes. AND DON’T LOOK AT SUPERMARKETS FOR FRESH MEAT! Fresh pork, chicken and beef can only be found in the town markets early in the morning. They are going to be sold out after 10 am. Most is powder but yes they drink milk. I am heading to the Philippines in Feb and want to bring some Canadian treats for my team. I am not sure what I can bring from Canada that they don’t already have – I planned on bringing maple syrup for them – and maybe ice wine. Any other suggestions? Anyone know anything specific to Canada? Filipinos love sweet and salty things. I would go with ketchup chips, Hawkins cheesies, chocolate bars such as coffee crisps, big Turks, or eat-mores. Kinder surprises would also be a hit as they would give those to their kids. you may find iodine in the pharmacy, but it is very hard to even get in the USA. You can get betadine in the USA, maybe they have similar in the PH, could be calling it something different. You may try iodiphor, I used that for sanitization in food service and breweries, you may find it useful. Then again, Iodine is a precursor to meth, so you may just have a very hard time finding it at all. Everything is local in the Philippines. If you go to batangas, coffee is cheap and plentiful. Go to Baguio and you can’t throw a stick without hitting a wood working shop. Getting good information is also impossible in the Philippines. wait long, wait long time. Food is great, irrigation is endless. IS THE PRODUCT CHEEZ-ITS STILL AVAILABLE IN THE PHILIPPINES? I usually purchase them in S&R or Rustans Supermarket but lately (actually for the past year) I haven’t found Cheez-its anywhere and I’m really sad. I’m going to the Philippines Bohol, Cebu and Palowin this week for a two week period, is there something I can take and sell off to compensate for the expense of the trip? I’m taking a two week trip to Palowin, Cebu, and Bohol, do you have advice for products to pack and sell there to make money ? I want to take some sweets (not chocolate). For the children of Filipino friends. What English sweets are not available in the Philippines? Well, I’m from Bacolod City. Better visit Bob’s in Lacson st., they sell wide variety of deli items and all those cheeses. Also, you may find some of the hard to our purchase items at Lopues’ supermarket. There is actually a baking supply shop at Shopping Center (place). What things can I get for free in the Philippines I ask if I can get a box but my girl say no need to buy it I say what about the market maybe after thy open it thy put in trash but no she say thy sell it I say what about bath room she say in mall but anywhere else you need to pay I say omg every thing I need to pay nothing if free pay for the air too to breath, lol. why not buy the things thy do not sell in amazon but food you can have some to buy it here in USA then send it by cargo or in airplane if not to big of a box. I just buy the things I need that thy do not have in amazon as for food I just send it in cargo from USA to Philippines because if thy do have the things I need it is hard to find it mostly in big mall you can find some thing but amazon is more easy to find what I need you can also use lazada but I like amazon better because Lazada does not have every thing amazon has way more and it is more easy to use and find what you need you can find thing in Lazada but I take long to find it but I only use one or other if I can not find it in the mall I know this is old post you made but still wanted to answer it. Royal stores sell mainly US and Australian products and yes Jello. Pudding and gellatin. Again Royal stores. Most beef is USDA or Australian beef. Sour cream is available by Nestle Philippines or at a larger store like Rustans or a Euro grocer in Makati. If they carry the yogurt and reconstituted milk they can get it. UHT milk/juices are common. The duty free stores also carry many of these items. PriceSmart, Rustans, Royal Subic, DutyFree, PureGold. In small towns or Barangays there are only family run stores or sari-sari’s to buy things. Healthy Options also carries a good variety of items and can order from other locations. Most people commute to a larger area for shopping every couple weeks or have a friend that does so. Many Filipinos are lactose intolerant, not so popular but there is ice cream most places. Laundry soap comes in bar, powder, liquid both local and foreign brands. We like Perla hypoallergenic. If you get your laundry done beware the chemical smell is over powering and they will use a lot of laundry soap. I don’t know that many that still do the handmade laundry (unless paying lavendera) but it is a good way to wear out your clothing. Dish soap comes in liquid and paste, we like the paste. There are ovens and microwaves, Ansons has them on their website as does Wilcon. Of course there’s soap in the Philippines. The supermarkets in the Philippines are much like Walmart. Microwaveable popcorn, definitely. You gotta explore more. The Philippines is like an extension of the US, you know. The philippines has sour cream and campbells soups. My aunt has been using these ingredients since 1997. Y’all just need to keep looking or ask the locals for questions. Metro Manila is a busy city and it will have most of the things that western countries sell in terms of canned food and imported candies… Even Bush’s baked beans.